Buy Beauty Blender Cleansers online at boozyshop, the makeup webshop that makes online cosmetics shopping fun! With one of the Beautyblender cleansers you can clean your Beauty Blender in no time. The cleansers provide a deep and hygienic cleaning. You can also clean your entire brush set with the cleansers, win win! The cleansers give a wonderful and soothing scent and are free of parabens and sulphates. We love it. Do you have a question, do you doubt or do you want to turn to professional advice? Please feel free to contact our Boozyshop live chat. This way we can provide you with a suitable advice so that you can purchase the cleanser you are looking for. Take a quick look at the Beautyblender cleaning products range! Dampen your Beautyblender before you get started with the cleanser. 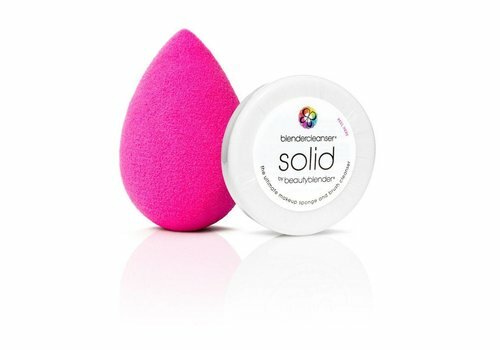 Remove the excess water and apply a dosed amount of Beauty Blender Liquid Cleanser to the sponge. Rub it gently over the Beauty blender and remove impurities. Then rinse your Beautyblender and dry it with a towel or let the sponge dry. Rub your sponge over the soap. Gently squeeze the Beautyblender and clean it again to rinse out excess soap. Good to know: your make-up brushes can be cleaned in the same way. When you take a look at the wide range of our webshop, you will see that we offer an extensive range of products that are full of affordable products. And fortunately there is more! Does your order exceed € 30? It's your lucky day! An awesome gift is included in the order. Would you also like to order quality make-up products and would you like to do this at a competitive price and interesting conditions? In that case it is definitely worth to place this order here at Boozyshop!